“Within minutes of applying for an OCBC Bank card, you could be using it via Apple Pay,” the bank states. 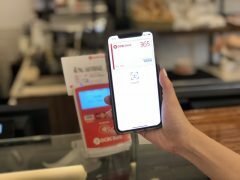 According to OCBC Bank, it has become the first bank in Singapore to enable instant digital card issuance and provisioning on Apple Pay via its mobile banking app. Customers can transact at merchants that accept Apple Pay “within minutes” of applying for a new Visa debit or credit card. “There is no need to then wait for the physical plastic to arrive in your mailbox,” the bank says. The card can be accessed and added to Apple Pay instantly once approved by the bank (which is also “almost immediate”). The feature is available for the OCBC 365, Frank, Voyage, Robinsons Group, Plus! Visa and NTUC Plus! Cards, as well as the Yes! debit card. The bank says Visa cards make up nearly 80% of its cards currently provisioned to Apple Pay.